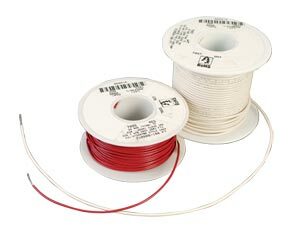 The HW7000 Series Hook-Up Wire is a "tougher" version of PVC insulation, irradiated PVC (exposed to electron beam radiation) has better abrasion and cut resistance than ordinary PVC and can be used more readily in soldering applications. It is ROHS compliant and is tinned copper to minimize oxidation, and is available in multiple colors. This IR PVC insulated wire can be used in military harnessing, medical electronics, power lead supply and appliance wire applications, where point to point wiring is required. * Specify Color by entering color code from the chart. ** Specify Length “-100” or “-1000”.